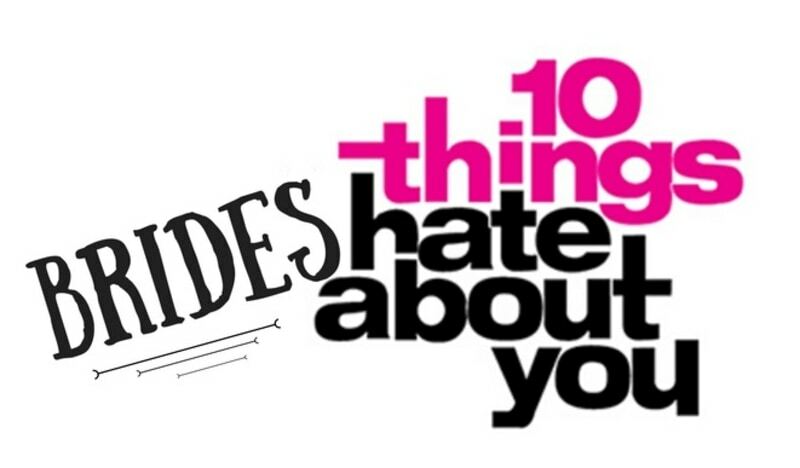 10 things brides (might) hate about you! What are the top 10 things brides and grooms (might) hate about YOU – their wedding suppliers – in the run up to their big day? Couples complain throughout the wedding planning process. Fact. It’s a stressful and exciting time for them but it’s also a time where expectations are challenged – as are wedding suppliers. So what are the top 10 things brides and grooms (might) hate about YOU – their wedding suppliers – in the run up to their big day and how can you help ease any tension and ensure a smooth running wedding season for yourself and your couples? You can put couples at ease during the wedding planning process by keeping close contact with them, even if it’s just a reassuring email to let the bride or her mother know that everything is in hand. Responding within 12-24 hours is pretty standard and most brides and grooms will simply not tolerate having to wait a week or more to hear back from you. You should also make an effort to respond to Millennials in a suitable way. Be available on Whatsapp and monitor social channels to check you haven’t missed any enquiries on Facebook; check Pinterest to see if the couples you work with have shared Pins with you on ideas they’re hoping to discuss or themes they’d like your help to recreate. It’s not your day and despite having helped plan a-thousand-and-one weddings yourself, you must first and foremost please the couple you’re working with. Advice is great but there comes a time when you just have to go with the photographs, flowers or food combinations your soon-to-be-newlywed couple asks for, even if you disagree with their choices. Remember every couple is different and you must start anew with each of them – no matter how bizarre some of their requests may be! No matter how demanding a bride or groom is, you should always maintain a friendly, professional tone when responding to emails, texts or calls. It’s ok to answer succinctly but make sure your response doesn’t border on snappy. You should take the time to respond to their questions with more than yes or no answers so that the couple you’re working with feel loved, not like a nuisance. Chances are this is their first time planning a wedding and they need your reassurance, not to sense your frustration. Lots of brides know exactly what they want but most will need some ideas and suggestions from a professional who’s been here before. That’s you. Ask your couples lots of questions to get to know them and gauge their style. By finding out more about ‘their story’, that is, how they met and how they got engaged, you’re more likely to come up with ideas that suit their vision. Be prepared to share a few photos you like from weddings you’ve photographed, a few example bouquets from the last wedding you were really proud of or a few bridal hair pictures from a previous wedding similar to the one you’re helping plan for this couple. The more examples you give and the more helpful you can be, the less you should expect to hear from couples as they’ll trust your professionalism and won’t need to keep checking in. Budgeting is one of the most stressful but important elements of wedding planning and brides and grooms need to know who and what they can afford to hire. If you’re reluctant to share your prices or are avoiding being completely clear on what ‘extras’ couples can expect to pay more for they’ll have no idea what to expect from you. The clearer you can be at this stage the more respect you’re likely to earn from couples and the less time you’ll have to waste going back and forth clarifying things. Tip: you can include pricing details on your Bridebook profile so a lot of couples will come to you knowing what you charge already. It’s all well and good putting together the ideal wedding in theory but couples genuinely fear that you’ll forget something major on their wedding day or even just not show up at all! Whilst we know this is unlikely, you can reassure couples that you’ve got everything in hand by keeping in regular contact throughout the wedding planning process to help ease any worry and to make them feel better about your plan for their big day. Think of yourself as your next couples ‘wedding dream team’ and make an effort to make them feel special and comfortable. Their wedding is in your hands! If you offered the bride and groom an enormous choice of table linens to pick from and assured them that you could get any decorations they wanted, don’t disappoint them with a measly choice of tableware and props. The best way to keep the couple happy and ensure you’re left with good reviews not a bad reputation is to ensure that you don’t make promises you aren’t certain you can keep. If you think a bride’s demands are outlandish or her timeline is too tight, don’t say “Absolutely! It’ll be fine.” Be honest upfront and your couples will respect you and trust you more for it. Professionalism constitutes many of the points we’ve already discussed, like communication, tone of reply and support. But it also means being on time to meetings, arriving early to the wedding and delivering on your promises. It’s much easier to win new bookings through recommendations than to attempt to attract couples through cold forms of marketing and with questionable reviews about your services circulating the internet! Some wedding suppliers assume that because they’re behind the scenes at a wedding, they’re not on show. Nothing makes a person stand out more at a wedding than being drastically underdressed. Dress like the professional you are so that couples don’t have to look through their wedding album and forever see that you wore jeans and a t-shirt on their big day. Every couple deserve to feel special in the run up to their wedding day. For them, it’s only happening once and they need you to understand their excitement, their fears, their frustrations and their uncertainties. Treat each couple as though you care; not as if they’re just another booking. Make an effort to remember the small details, and make sure that you smile and enjoy yourself. A happy couple will want you to seem as though you’re genuinely happy to be a part of their big day – which hopefully you are! And happy couples leave good recommendations, remember. Do these complaints sound familiar?